Cape Town – The Western Cape’s four major tertiary institutions have received more than 95 000 applications for about 22 000 first-year spots on offer. 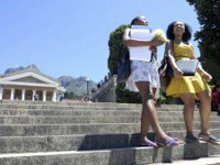 UCT, the University of the Western Cape, Stellenbosch University and Cape Peninsula University of Technology have all received more than twice as many applications from prospective first-year students as the places they have available. * UWC, which has space for 3 800 new students, received 34 000 applications for the 2013 application cycle. * Stellenbosch, which can accommodate 5 000 first-year students, received about 16 000 applications. * CPUT, which will be able to admit about 9 281 first-year students, has received about 25 000 applications so far. * UCT, which can accommodate about 4 200 first-years, received about 20 000 (first time entering undergraduate) applications. “Demand for places exceeds the space available. The challenge is not unique to UCT,” said Gerda Kruger, executive director in UCT’s communications and marketing department. Neels Fourie, a deputy registrar at Stellenbosch University, said providing lecture rooms, laboratories and other facilities to accommodate the number of students enrolling were among the logistical challenges the university had to deal with. “Various projects are currently undertaken to address the challenges. These include building new and upgrading existing facilities on campus, as well as upgrading laboratories,” said Fourie. UWC has also embarked on several projects to expand its facilities, and UCT has similarly invested in a number of projects to help alleviate congestion on campus. Kruger said all programmes of study were highly sought after. The demand for places at UCT was spread across all faculties. At Stellenbosch, the MBChB (Bachelor of Medicine and Bachelor of Surgery) programme had received the most applications, while the BCom was most popular at UWC. At CPUT, nursing and radiography and general education and training were the academic departments with the highest number of first-year applications. UWC spokesman Luthando Tyhalibongo said not all applicants would be accepted. Some students also applied to more than one institution. Earlier this year, the mother of an applicant died during a stampede at the University of Johannesburg while accompanying her son to apply for a place at the institution. * UCT: Parents can expect to pay about R34 000 for the first year of BA studies, according to the 2012 UCT fees handbook. Those studying towards a BCom can expect to pay R37 500 to R46 500 in the first year and BSc R40 500 to R42 000. * UWC: The first year of BA studies will cost about R19 030 (2013 fee increase not included). To study BCom will cost the same, while BSc will cost from R19 030 to R26 490 (depending on the stream). The top three programmes for 2013 were BCom ( 2 466 applications), BSc (2 145), BA Social Work (2 119). * Stellenbosch University: The first year of studies towards a BA costs about R28 252, R27 327 for BCom and R35 382 for BSc. The MBChB programme has received the most applications, while the BCom programmes in the faculty of economic and management sciences are also very popular in terms of number of applications. * CPUT: Nursing and radiography (4 176 applications) have received the most first-year applications so far, followed by general education and training (3 151), information technology (1 353) , human resource management (1 060), civil engineering and survey (1 044), electrical engineering (1 017) and financial accounting and taxation (1 001).